Just after New Year and coming back from New York and Germany, I spent some time in Seville, Spain. Now, the plan was to go out there 10h a day and explore the landscape and the city to get some great shots... Yeah, this did not really work out. See, living in Dublin, a beer costs somewhere between 5-7 Euro. In Seville? One Euro. ONE! So, relaxing was what I did instead of taking pictures more often than I wanted to, hehe. 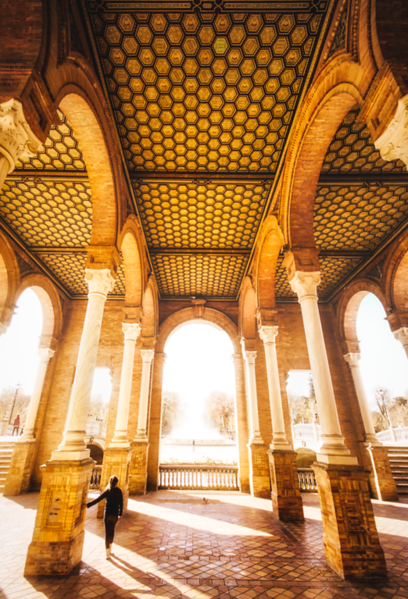 In any case, this is Plaza Espana in Seville, the main square that - if you go off-season like me- is nearly empty of tourists and therefore awesome for photos. The palace or whatever the building is called is simply stunning - I mean, just look at it!